After breakfast am at leisure. PM: Half day sightseeing of New Delhi visit to Qutab Minar & Secrretariat Buildings or visit to Akshardham Temple. Overnight at Hotel. After breakfast drive to Rishikesh. Check in hotel. Pm: Visit to Parmath Niketan for Ganga Aarti darshan. After Ganga puja return to the hotel. Overnight hotel. Early morning drive to Ghuttu , a small Garhwali village and starting point of the trek. Enroute lunch. Explore the village. Overnight at Camp or Garhwwal Lodge. Early morning leave embark on to trek for Panwali. The trek today is very steep. About nine kilometers of steep ascent takes us to Panwali. Arrive and camp in the meadow near a stream, as the entire meadow is full of crystal clear springs. Meals and overnight camp. After breakfast a gradual descending towards Magguchatti . The entire trek is on rocky terrain and is strenuous. Arrive Magguchatti and camp. Meals and overnight camp. Early morning after breakfast trek to Trijugi Narayan, a legendry village where Shiva & Parvati were wedded. Arrive and visit the temple. After exploring the village we trek to Gaurikund. 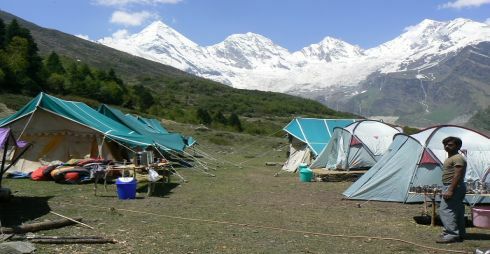 Today we camp little before Gurikund, near the river. Meals and overnight camp. Morning we visit the Gaurikund temple and the hot springs. Afterwards we proceed for Kedarnath. The entire trek is gradual ascent till we reach Kedarnath. Arrive Kedarnath & camp. Meals and overnight camp. Day free to visit the temple and explore the area. Meals and overnight camp. Return trek from Kerdarnath to Gaurikund. Arrive Gaurikund and have a refreshing dip in the hot spring pool. Meals and overnight camp. Breakfast & drive to New Delhi. On arrival hotel check in. Rest free at leisure. Overnight at hotel. Breakfast & free time till departure. Check out 12:00 noon. A common tendency among beginners and the experienced is to show enthusiasm by walking fast; this is soon exhausting warm up gradually and continue at a slow comfortable pace. Develop a personal rhythm. Lift and keep your step in synchronization with breathing. This should minimize getting out of breath. Walking on the level, place the foot flat, heel first, to obtain a better grip and gain a few centimeters with each step. Walk in zigzags while ascending a very steep slope. Avoid stepping on loose stones. Avoid overtaking fellow travelers while walking on a narrow trail. Ascending/ descending a scree slope or over loose stones, leave sufficient space between the next person so that any stone rolling down does not hit others below. Do not run down a slope. Flex or bend knee a little while descending. Dig heels into soft snow or soft ground. Wet grass, pine needles and wet roots can be very slippery. Be careful while walking on them. Shortcuts on a foot trail should be avoided. Put on warm clothing while taking rest. Respect the sentiments and traditions of the local hill people. Respect their women and avoid mixing ort talking with them. Don’t damage crops by walking through standing harvest. Always carry some water in your water bottle. During a rest period, lie against a tree trunk or a big stone. Place your legs on your rucksack or on any other higher place. This will regulate your blood circulation. Stop about 15 min. after the first start to readjust your rucksach or to tie a shoelace etc. Do not make halts frequent or prolonged. Too many halts destroy walking rhythm. Frequent rests are not needed of you follow the right walking techniques. Stop should be made, wherever possible, at natural stopping points, like on the top of a ridge, of before a difficult ascent, or at a scenic viewpoint.